After self-examination ("in right") and fellowship ("out right"), the third area of growth while being a follower is worship (“up right”). For worship to be effective, you must become like Him, be in awe of Him and express your feelings for Him. There are an endless number of things that should make you feel in awe of God, but perhaps none is more powerful than the realization that He cares for you personally. He knows your name, your address, and even the number of hairs on your head. God knows and loves you more than you know and love yourself. In Psalm 145:5-7, David used the word “awesome” to describe his condition of awe when faced with the greatness of God’s goodness. “I will meditate on the glorious splendor of Your majesty, and on Your wondrous works. Men shall speak of the might of Your awesome acts, and I will declare Your greatness. They shall utter the memory of Your great goodness, and shall sing of Your righteousness.” (NKJV) David knew how to worship. Our English word for worship comes from several Greek words that mean to kiss toward, to experience a feeling of awe, or to render religious service or homage. (Vine’s) The respected Greek scholar, W.E. Vine notes, “A consideration of the above verbs shows that it (worship) is not confined to praise; broadly it may be regarded as the direct acknowledgement to God, of His nature, attributes, ways and claims, whether by the outgoing of the heart in praise and thanksgiving or by deed done in such acknowledgement.” In other words, true worship is an acknowledgement that comes from an attitude of awe. From this definition, we learn several things. 1. Biblical worship is not a time or location but a condition of the heart. Since worship is not simply an event, but rather an acknowledgement born from an attitude of humble dependence and overwhelming appreciation, new Christians should search for atmospheres that promote these expressions of “awe!” Just because a gathering is called a worship service, that does not make it one. As you will see in the next section, true worshippers are called to worship in spirit and truth. Be sure you seek out a congregation that worships both with awe and appropriate expressions of that holy condition. 2. Since true worship is a condition of the heart, opportunities to worship can be found more often outside of the collective gathering of the church than they can within. In 1 Thessalonians 5:16-18 the Holy Spirit says, “ Rejoice always, pray without ceasing, in everything give thanks; for this is the will of God in Christ Jesus for you.” To obey this passage, worship must be part of your everyday experiences. 3. True worship is more than just praying, singing, and engaging in other traditional forms of praise. Worship can also be expressed through serving the less fortunate, personal change in character, or triumphant endurance over hardship. Worship is a positive acknowledgement of God and it should be part of every moment of every day. Whether worship is expressed in a church gathering, as is commanded by God (Hebrews 10:24-25), or individually, as is also commanded by Him (Matthew 6:6), worship is only acceptable when it comes from hearts that are filled with awe. Search for reasons every day that can draw you into this attitude of worship. Look for a support group that will encourage your search for moments of awe. Never neglect the collective assembly of your spiritual family. Look for God in everything that you do and your very life will become an ongoing worship service to Him. One of the classic old hymns includes the words, “Count your blessings, name them one by one.” Few things will help you develop a deeper appreciation for God than taking a regular inventory of the ways He has blessed you. Look at a nature magazine with the express purpose of seeing God’s splendor. Spend time with people who often speak of God’s goodness. Limit your time with those who view life more like a funeral service than a celebration of God’s gifts. List three responses to the condition of awe that David mentions in the passage above. Besides awesome, list three other words that David uses in this passage to describe the nature of God. Beside each write an example of how you have seen that quality of God in your life. What location or activity draws you into awe? 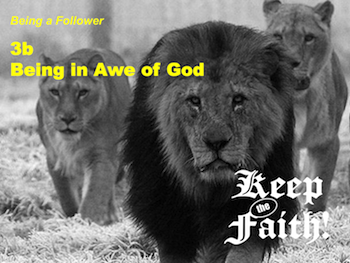 What could the church do to better promote the condition of awe in her weekly gatherings? Also, don't forget the first seven lessons in the "Being a Follower" section! Back to Top of "Keep the Faith! Being a Follower 3b"